John Pryer received his musical education at Ely Cathedral, Clifton College, Bristol, and Keble College, Oxford, where he graduated and gained the diploma of Fellow of the Royal College of Organists, winning the “Limpus” and “Read” prizes. After teaching posts in Bath, Bristol, and Repton School, he became assistant to Roy Massey at Birmingham Cathedral, later playing at St. Chad’s Cathedral, St.Paul’s in the Jewellery Quarter, and the Birmingham Oratory. 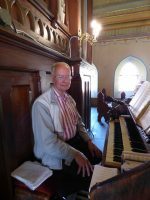 John has given recitals in many prestigious venues, both at home and in Europe, but his first love is to be an Organiste Liturgique.